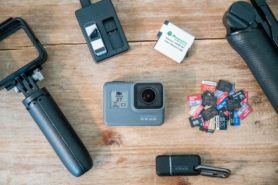 When the VIRB 360 was announced this past spring, it was one of the first single-device 360° action cameras to actually produce higher than 4K resolution video files that looked good. Previously, even 4K, 360° action cameras didn’t look all that spectacular, because the 4K resolution was stretched over that entire 360° view, so your effective resolution floated between 720p and 1080p. With the VIRB 360 though, the camera stitched two 4K video sources together (Side note: in video math, 2x4K does NOT equal 8K, but rather 5.7K. I explain it in the review here). The process of pulling those files together into a single file is called ‘stitching’. How well a company does that will drive whether or not you think 360° video is worth your time. Bad stitching manifests itself in many ways, from lopsided lighting to visible seams. Anyway – back at launch, Garmin only supported in-camera stitching at 4K resolution (not the 5.7K the unit was capable of). If you wanted higher resolutions you had to manually stitch the two 4k files together using 3rd party apps. Those apps were either incredibly expensive, or complex to use (or if easy to use they were limited to 4K anyway). Until now. Now you can use Garmin’s own free VIRB Edit app to not only stitch everything together at 5.7K resolution – but also overlay metrics like speed, g-forces, heart rate, and many more. 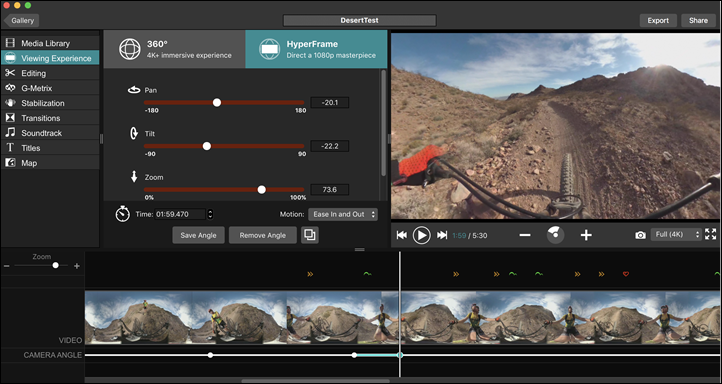 Further, with the new HyperFrame functionality, you can take a 360° video and export a flat 1080p video angle from it, allowing you to get traditional 1080p footage but with all the angles of a 360° video. 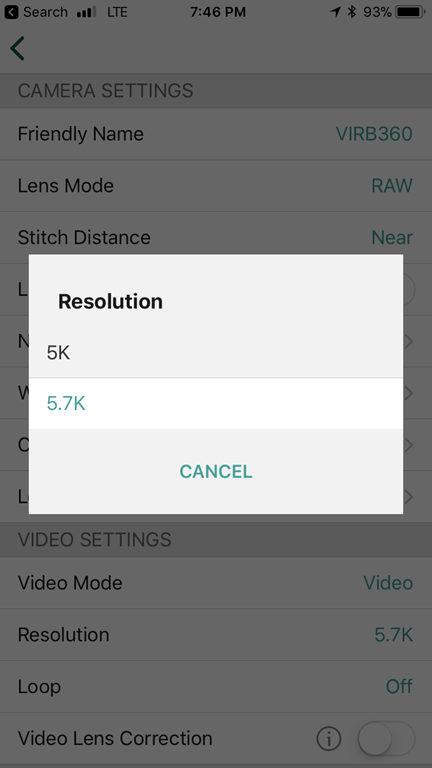 First up is the new 5.7K stitching mode. 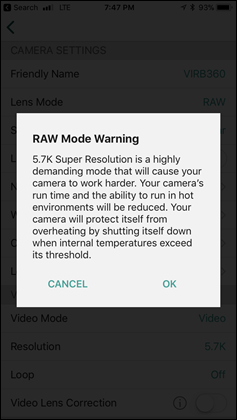 In order to get this to work you’ll need to ensure that you’re both recording in RAW mode on the camera AND have set the RAW mode to 5.7K. 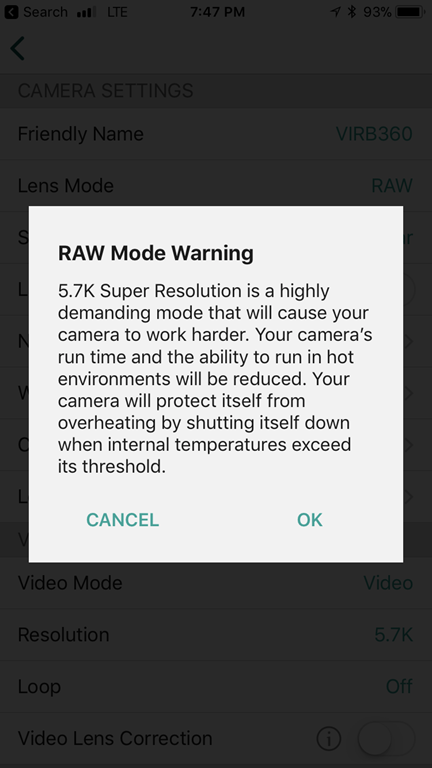 By default if you record to RAW mode it won’t be at 5.7K. You have to do this on the mobile app, as for some odd reason the camera itself doesn’t allow you to select this resolution. Once that’s done you’ll plug your camera into your computer with VIRB Edit. In this case RAW file support does need a computer and not your phone, because the processing overhead is just so high. That’s why they can’t do the stitching in camera, as it’s simply too much of a drain. Once plugged in you’ll see the files within VIRB Edit with a funky icon. This icon means it’s automatically finding the two sets of files and considers them one. On a Mac the UI is slightly different but it automatically finds the pairs as well. Obviously, you should set 5.7K and Max. I mean, you went this far – don’t cheap out at the end! After clicking import it’ll ask to name the set as normal, and then it sets off on its stitching adventure. It’s at this juncture that you can go off and have a long dinner (depending on how much footage you’ve got). It’s gonna be a while. I will note on my 2016 MacBook Pro it was far faster than my 2017 Lenovo T470s (like, hours faster). However, as of today, September 21st, 2017 you can’t yet process to 5K/5.7K on the Mac. That’s because Garmin is waiting for MacOS High Sierra, which is slated to release to the public any day now. That OS supports the higher resolution 5K/5.7K files. Garmin says that as soon as Apple publicly ships that, they’ll probably need a couple of weeks to validate everything and then will release a Mac VIRB Edit update with 5.7K export capabilities. Still, you can certainly capture RAW stuff today in preparation for that. At this point, you can do all the normal editing you’d do within VIRB Edit. So things like data overlays, music, etc… That’s all the same basically. Note the 5.7K resolution in the lower right-hand corner. Also, note the overlay in the middle of the screen. 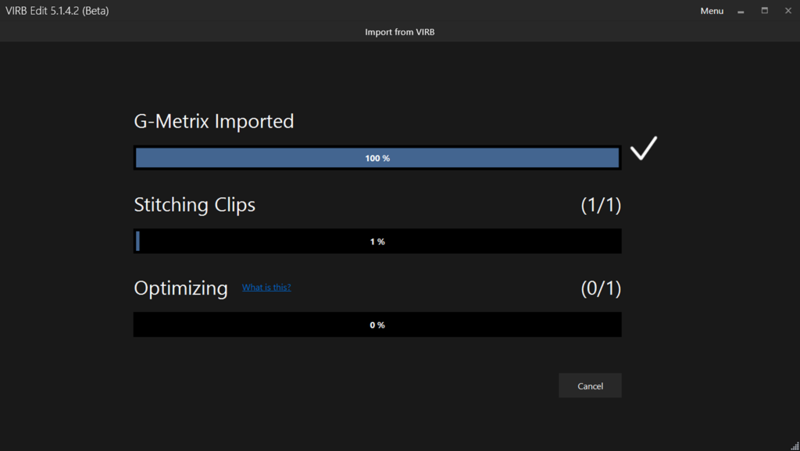 And then from there you can export off the file for upload to various services. Note that too will take some time. Of course…whether or not your computer or device can actually playback that resolution…that’s a totally different problem entirely. But hey…gotta start somewhere, right? Nothing super exciting, but just shows it works. Next up we’ve got HyperFrame director mode. 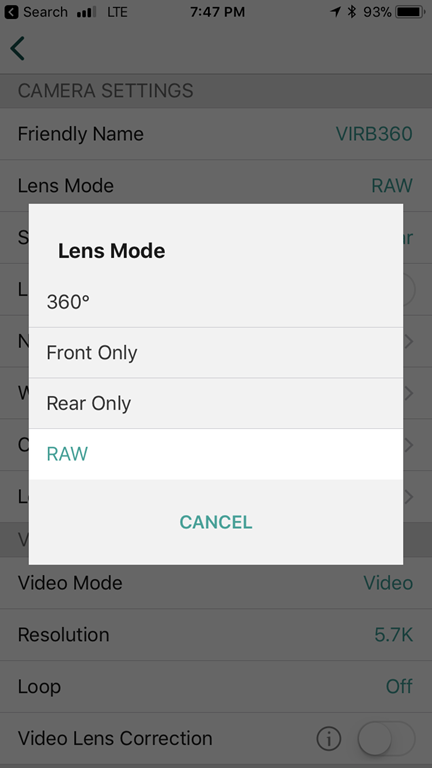 This mode allows you to take the 360° footage you filmed, and pull out specific 1080p flat video views. Thus getting you the ‘director’ mode concept. Pretend you have a camera on your handlebars and you want to force the view facing forward for a bit, and then pan back to look at your face, then turn to the side to watch a dancing bear go by. 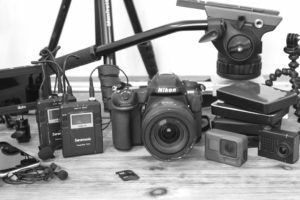 You can do that – ultimately exporting out a standard 1080p video (non-360°). You’ll remember GoPro discussed this concept (which they call ‘Overcapture’), back upon the announcement of their Fusion 360° action camera this past spring. But that camera isn’t due to start being available till later this year, and ultimately will have slightly lower resolution (5.2K vs 5.7K). Of course, we don’t know what quality will be like – so it could either surpass Garmin’s image quality (or not). Still too soon. In any case, Garmin’s mode is all about changing perspectives from that 360° footage. Let’s crack open some mountain biking footage from yesterday I’ve got as a starting point. 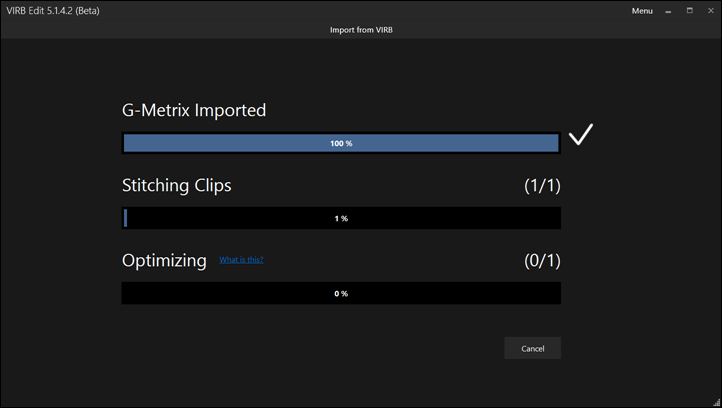 To start I’ll import all the footage as normal, and then click the button that says ‘Viewing Experience’. This then gives you the default 360° view, as well as the new HyperFrame view. Below that you’ll notice a bunch of options for pan, tilt, and zoom. Then further down the ability to add a new angle, as well as the motion within that angle. In my case, after I finished talking, I’m going to change the angle as I walk to the bike. So I’ll tap ‘Add New Angle’ at that point. As part of that, the camera will automatically pan between these two angles. Or I can have it ease in or out of these. And I can continue tweaking things the entire time. You’ll notice below the video there’s a line with a bunch of dots. Each one of those dots is a new camera angle. 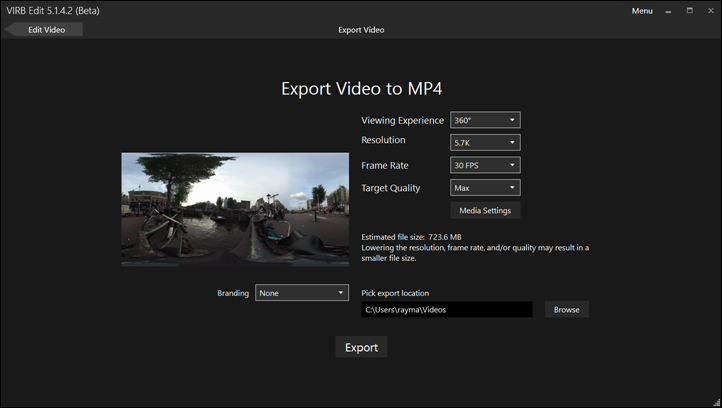 Once done, you’ll export out a simple 1080p clip, no 360° footage included. 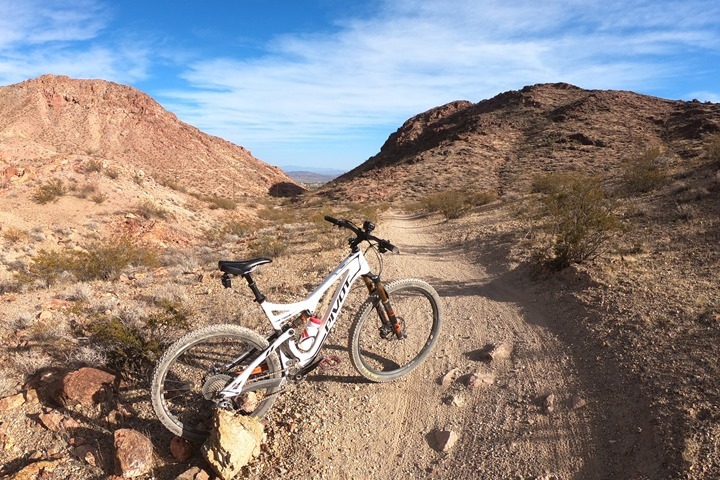 If you had lots of time and had properly placed the camera (unlike me on this mountain bike), you really can do some pretty cool stuff with this. Speaking of ‘could do’, I present you with ‘didn’t do’, my short little video clip below that lacks a lot of cool. But, it shows how it works. Again – tons of potential here for those that have both creativity and a bit of time. Especially once you start looking at different shots merged together. Though, as with previous, I will say the VIRB Edit suite still leaves a bit to be desired for things like being able to place music at places other than the start, as well as just being able to super quickly snip through video (lack of a waveform being one). 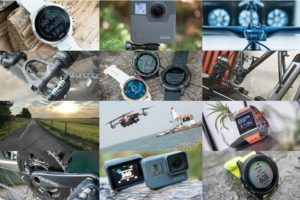 Still – we know that there’s no software team within Garmin that’s as focused on adding new features as the VIRB Edit group. Anyone who has followed the history of VIRB Edit over the years knows that – it’s incredible how much new stuff keeps getting added into the free app (be it for the 360° cameras or the regular ones). So I suspect it’s on the to-do list. The night shot ones are accessible via the VIRB Edit mobile app. Hi – Couple of quetsion fairly loosley related to this post. 1) Can the VIRB Edit handle footage form a GoPor ? 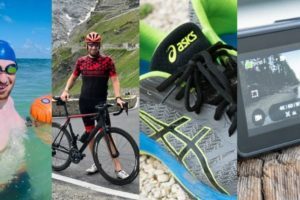 3) And if there a third party solutions that readers would recommend, bearing in mind these are pretty boring videos of me cycling or running or skiing etc, and i am not trying to win an oscar. Just make them slightly more palatable viewing. 4) Also any news on what happened to the GoPro Polar link up. I like that the Virb can spit our Speed, HR etc, did GoPro an Polar ever get to that point? 1) Yup, it does (assuming you’ve got a Garmin .FIT file to pull in the metrics data too). 2) I haven’t tried that to be honest. 3) I’d really recommend VIRB Edit as a great free option. Obviously, if you’re talking paid then it’s things like Final Cut Pro or Adobe Premier. 4) Good point, I’ll poke around. Virb will handle GoPro footage just fine. GoPro desktop doesn’t handle Virb footage, not sure about Quick, though. Ray, the last video has some seriously spaghetti handlebars; about 1:14 in they look like cruiser bars, & later on they reverse to cowhorn bars, with a stitching (?) shadow. Was this just you doing something quick or is all the distortion a limit of the camera &/or software? Yeah, I basically put it in a bad place. It was the last run of the day and was running tight on time and light. 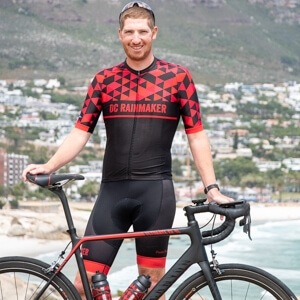 I’ve learned that while you can sometimes get away with doing the handlebars on a bike, the better spot is really slight above the helmet and outwards. That said – there’s probably also an element of where the random things I was attempting to show within the new features made things look worse. The main thing I loved about the VIRB video is the fact that the 360 degree video could be played back ‘facing the direction of travel’. This should be a killer feature for user contributed video rides. Go on a ride, and play the video back in the ‘facing direction of travel’ mode controlling the speed from the smart trainer of your choice. Add a couple of buttons to the trainer handlebars to pan around and look at the view as you suffer. The 1 hour battery life is a limit for this though, as is the massive amounts of video data that you end up with. Although the flat 1080p videos would lose the “look around at the scenery”, it would at least preserve the ability to centre the video on the direction of travel. Funky things sometime happen, though, and I don’t know whether it’s the camera or VIRB Edit. I made a 3 hour video a few weeks ago and asked VIRB Edit for “follow path” stabilization (the stabilization is amazing, by the way). On a long descent about 1 1/2 hours in the camera/VIRB Edit suddenly decided to do a slow 360 pan around the direction of travel. Often around sharp curves it’ll get a little confused and the G-Metrix slew to one side and slowly come back to the actual path. Of course, since it’s a 360 camera you don’t lose anything, but the G-Metrix/point of view wanders away from the actual path. As for the battery life, two words: powered mount. Since I got my powered mount I’ve made many multi-hour videos without turning the camera off. I haven’t used the internal battery in quite a while. I deal with the amount of video by buying USB3 disk drives (thought about USB sticks, but the rotating rust costs less). Haven’t found a read-only storage option, though. BluRay, even dual layer, is too small, and I’m unsure if the multi-layer formats are well supported. Glad to see 1/2 s time lapse back. I’m going to try it out tomorrow. We’ll see if stabilization is any better in 1/2 s mode than 2 s mode. Super cool – I was waiting for this feature. The 360 Virb now moves further up my “wanted gadget” list! 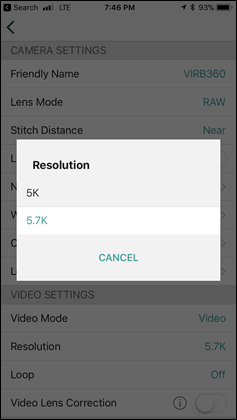 In the previous review you said that the Raw mode isn’t any more battery intensive than 4k mode (storing more data vs stitching less data). Is that still the case? The warning in the screenshot from the app seems to contradict that. I haven’t done a new battery test to see where things stand there. I’ll try and add it on my to-do for the weekend. To answer my own question here. What a great news!! !, I’ve been testing the new virb Edit, it’s not stitching raw files sometimes, hope they solve it….. This is really amazing stuff! It would be great if later the add the ability to create and save wirelines (recorded pan and zooms) that could be reused as well as the ability to correct the fish bowl effect (at least when not zoomed out too far – those shots of you on your little globe were hysterical). Then you could just collect your raw video data, and then do all your “film making” in post. By the way, there is a long- reported problem on your web site where embedded YouTube videos have the right side covered by the side panel on an iPad or iPhone. This obscures the icon which is needed to link to the original on YouTube, which must be done to either change the resolution (somehow they all are at 480p on my iPad) or properly view 360 videos (in the YouTube app). If you go full screen on iOS then there are no icons. Because the videos in this article are not linked on the DC Rainmaker YouTube site (at least, yet) there is no way to view them properly (at least on an iPad). I’m not sure I explained this correctly, but if you view this post on an iPad (not logged in as yourself) you can see the problem, I think. Very cool. Only question is where is the VIRB mounted during the bike video? I thought you had it on a pole in your hand but then you had both hands on the handlebars. Was it all one continuous shot? It was mounted on my handlebars (you can see it in the pic of the bike up above). And yup – that was all one continuous shot. I may have split an edit somewhere in there just for time savings purposes, but I only did one shot of that run. Also, due to the Mac 5.7K limit (I shot it all in raw), I lost some quality since I was editing in 4K and then downres to 1080p. I didn’t have the time for my PC to reprocess the 10min 5.7K clip, as that would have taken hours. 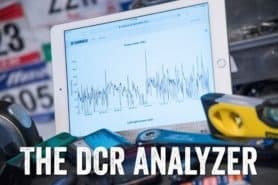 Nice to see a MTB shot, brings us hope to see more MTB focused content (powermeters, trainers, etc) here DC! Nice new feature but sorry! The quality of the 4K videos is on a level with an old GoPro2. As long as there is no 60Hz option the picture quality from fast moving platforms or of fast moving objects is not acceptable. I’m sure the next version will change that. Up to then I have to be patient. From uploading the video from the camera to the finished product took about 20 minutes! Nice – good example of what you can do with it! Thanks for the quick update. When I first tried new software i missed the near/far option on import for raw stitch. I’m excited to experiment more with night mode. There does seem to be some interaction between night model and time lapse. In my test outside last night with a few stars coming out of cloud the auto exposure on single night mode was 8 second exposure. I then switched to time lapse with 10 seconds. The resulting photos were just 1 second exposure. There may be black frame subtraction that requires more time, and may it goes back to 1 second when time conflict?. I’ll try 60 second later, and then extended time lapse vs. standard. Whatever ends up happening I’m very excited to have the night mode. Assuming that the API has ben updated (I haven’t check but I expect it was) I can always make custom time lapse control using laptop and command line. but I have hopes that extended mode might work. Another minor little iOS feature I saw was something like “Find Virb”. Clicking it makes the virb blink and beep until you find it. Not that useful, but I guess if it flies off your mounting in bushes it could be nice. Do you have any recommendations for software to edit these 360 videos in terms of light, colour, contrast, cropping, etc. I believe there are none of these sorts of features in the Garmin software. You can do some cropping in Director mode by way of zooming. In 360* mode of course, there is no such thing as a crop. Been waiting for clear sky for nice star test with Night Mode, but ended up getting nice day to night time lapse with clouds. All photos shot in Night mode iso 100, but auto exposure, which does let exposure go much faster then 1 second, even in night mode. I shot from 4:30pm to midnight, shutter range roughly 1/320 sec to 8 sec. Resulting in 1 minute video with time speeding up as shutter gets longer. Camera and mobile app doesn’t allow time lapse in night mode, so this gave me a chance to test out the api and control the camera from a ruby script via wifi. Just as an update to this, I made a post in Garmin forum about an iOS app that lets you send API JSON commands like status, features, snapPicture, etc from an iOS device. He was also really nice and updated it to have a repeat with delay for custom time lapse. If you want to play with the API this is a nice way to do it without having to work on a command line from your computer. That’s awesome – that’s really well done! Hmm, my guess is that there’s some tag in the files created after that firmware update that allows the automatic recognition to work. 🙁 I’ll plop some other ones in the RAW folder momentarily that you can check out instead. These will be from the last few weeks, which are on the latest firmware. thanks for the quick response!! you are the bes! No problem. And in case folks didn’t see, shortly after the post yesterday I dropped a set of RAW files into the previous/large Dropbox share with all my samples. It’s actually a really long video, an entire mountain bike run to look through. Located under the one that says Sept 2017 samples for RAW. Hi, first of all thanks for all the great content on this site and on youtube. I consider buying the virb 360 but in some reviews it was mentioned that the 16:9 format of the output is somewhat problematic since in the VR world equirectangular 2:1 is a sort-of standard. Any thoughts on this? Since there are so many videos out there, e.g. 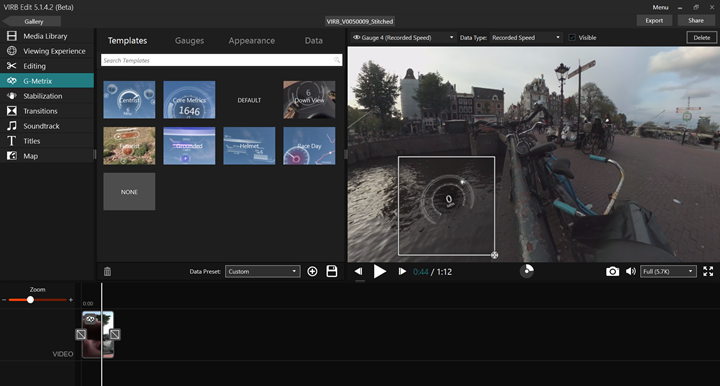 on youtube, created with the virb 360, I assume it somehow works 🙂 However, I don’t have any experience with video editing yet and I don’t want to buy additional software just for stretching the video into 2:1. Since I’ve got a Samsung Gear VR I want to use it to impress (or bore?) my family and friends with 360 content. Have you received any response? I’m wondering why the video is 16:9, and what is the correct way to interpret it. Thanks for the reply earlier. Im wondering is the hyperframe director mode only available on certain virb edit version? But I coul not find the viewing experience tab. Make sure the video you’re viewing is 360 video. Garmin hides abilities when they’re not applicable rather than displaying but graying them out as Apple traditionally does. 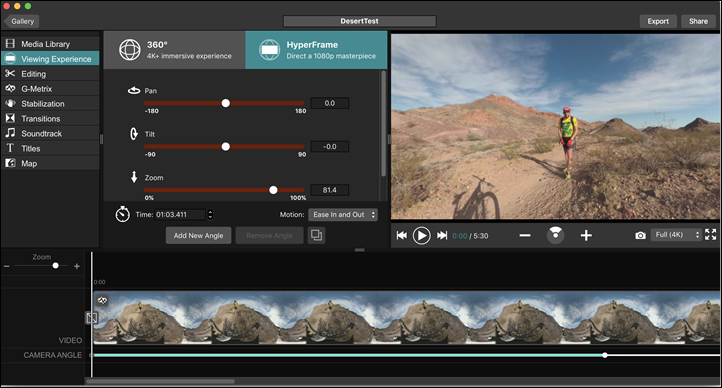 The hyperframe director is for 360 video, and shows up between Media Library and Editing. What you’re showing is what it displays for flat video. 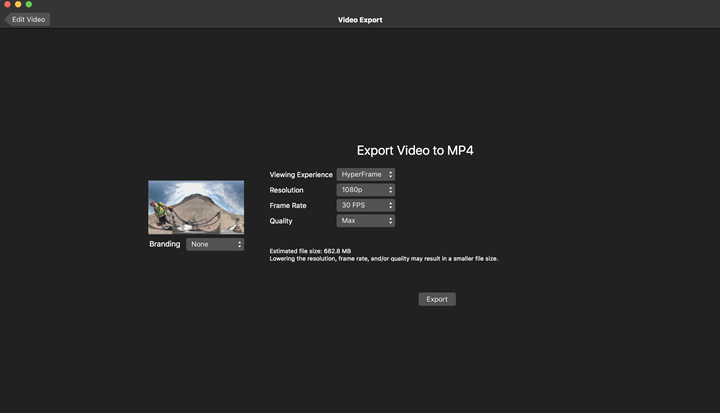 What macOS VIRB Edit 5.2.1 shows for 360 is attached. and it still takes an absolute age which is disappointing. I was surprised at how CPU intensive it was to stitch, I had thought that it would utilise the GPUs. It is slow at both the stitch stage and the render stage. My main use case for the camera is a cycling safety camera whilst commuting. Most of the time I will delete the footage but sometimes I will probably want a 4 minute section out of the 1 hour video. This means that I have to import and stitch the entire 1 hour video to be able to crop to the 4 minute section. Ray – any idea if cropping before stitching will ever be a feasible workflow? I am trying to figure out the difference in resolution that I will actually get using the on-camera stitching versus the 5.7K raw mode. Ray, you say that most 4K cameras are actually pretty awful in 360 as there is only 1 4k sensor. Can I assume that the on camera stitched mode for this camera is better than that? I am trying to get an idea of how clear for example a distant number plate will be in on camera stitching mode vs 5.7k mode. On camera stitching is LOADS easier to work with (works in mobile as well) but I will be losing out on number of pixels. I’d go with on-camera stitching for you. In your case you’re still stitching two 4K sensors together, it’s just doing so with an output of 4K vs 5.7K. So you’ll lose some resolution of course, but it’s a million times easier than post workflow. I inadvertently output a 5K version of this video first before realising and then uploaded a 5.7K later (about a day later as it takes AGES). Somewhere, someone asked about the status update on 5.7K RAW stitching for Mac (it’s available in PC already). Back in September Garmin was waiting on High Sierra to release, which did shortly thereafter. 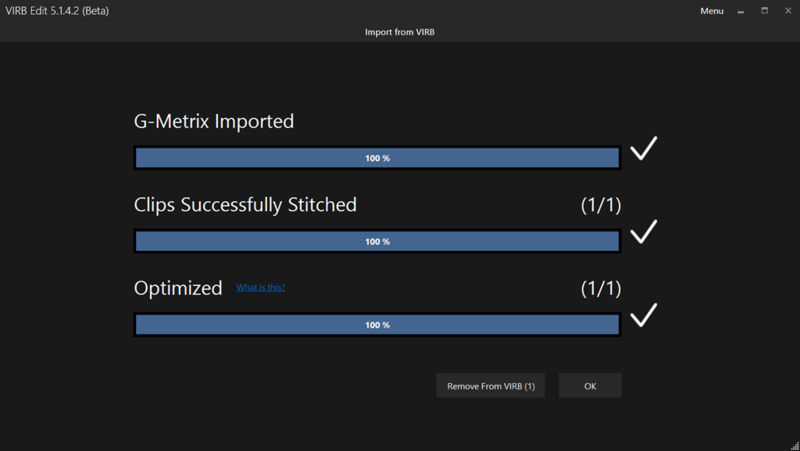 At the time they had hoped to release an update for VIRB Edit to allow 5.7K RAW stitching/export shortly on Mac. Have you heard any further updates on this? Yup, I got a beta build over the weekend actually. Thus, soon! Amazing how it’s so much easier to just ask you than bother reaching out to the companies involved. I can’t wait for that update to be released. I really want to start using the camera this year for my travels. I also hope they will implement a way to import the footage from an external drive. I have done some recordings in 2017 all waiting in maps on a drive. Until now I haven’t been able to find a way to import the RAW footage from an external drive and stitch those, in stead I have to copy the footage on MicroSD card and read/stitch them thru the camera. Stitching those in 5K7 with Virb Edit and then finish the whole story inside Final Cut Pro X would close the gap in my workflow. 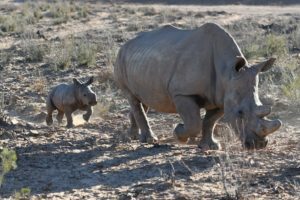 I wrote another post on their forum but is very quiet and the interaction is near to zero. I wish they would be more interactive with their users so they can improve their products. Let us test their beta builds perhaps. I have done that many times for Adobe. 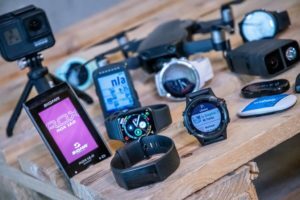 Any chance you heard anything from Garmin about the Mac update. It has been moths now that High Sierra has been released, but still no update with 5K7 stitching. 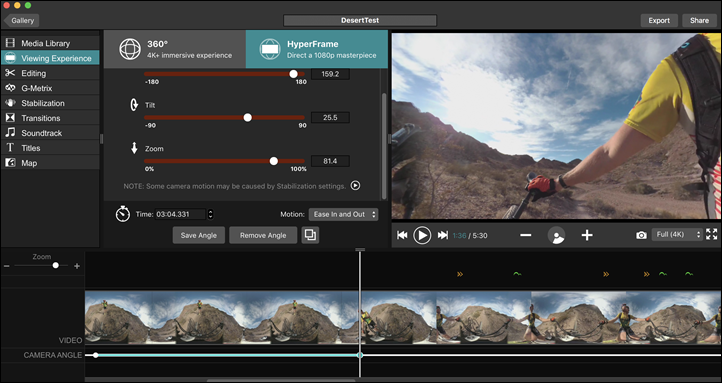 I’m really hoping they release the next version now that Final Cut Pro X can work with 360 video. Oh thank you very much! I completely missed that one! The new Mac version works great! It takes time to stitch the two files together as one video, but the results are fantastic. The stitched 5K7 equirectangular videofiles are 5760 x 2880 (true 2:1) and can be edited in the latest version of Final Cut Pro X (10.4). With the footage on a SSD drive the footage can be edited natively (6K) or via Proxy and Optimised files (those are huge!). 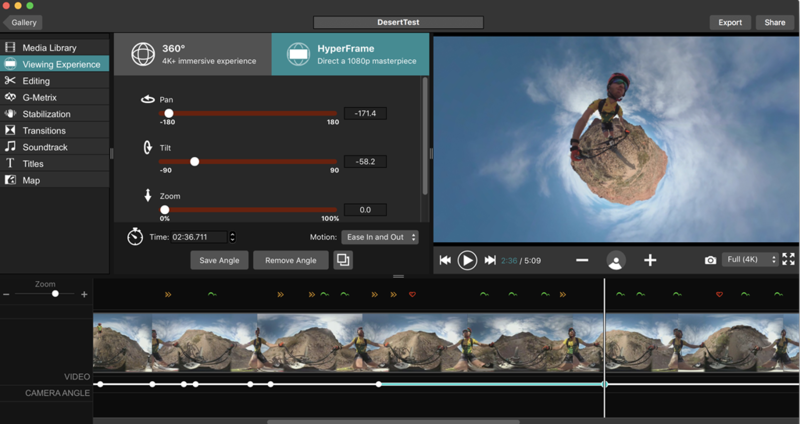 Final Cut can handle the 360 files with ease, add effects, control color and finally export your edit to Youtube where you can watch it in 360. I am planning on recording a roughly 8 hour cycling event later in the year on my 360. I was hoping to do it 5.7K but in my tests the camera dies from getting too hot. (tested in 40 degree C room lasted about 30 minutes, at 20 degrees about an hour). I’ve now decided to go for 5K so as not to risk the camera giving up. I did a test on a 1 hour 5.7K clip and it took more than 20 minutes to do 4% – that means around 8 – 10 hours to stitch 1 hour of video (at max settings). I have compared the low and the max quality videos and I really don’t think that I would be able to pick the max over the low quality. I am really not sure that I can see ANY difference. Am I going mad? Is this just youTube processing stripping all the extra data out? Something’s not right there. Are you not uploading at 5.7K? Or ‘just 4K’? I ask because in looking at the little settings icon, I don’t see the full 5.7K upload showing (only 4K). That means you’re uploading at 4K, or something below 5.7K. …and…I just read these out of order on the WordPress dashboard, and didn’t see your comment about 5K vs 5.7K. Hmm, yeah, I’m not able to easily see the differences on my computer at the moment (low battery so can’t turn up brightness all the way). I have a recent iMac and when I export a 5.7k 360 video from my Garmin 360 it will not play properly in Quicktime. It plays unstitched showing video from only the front camera although I exported as a stitched video. Also after I upload it to utube it will not play in safari. Do I need new software to play 5.7k video on my desktop and from utube? If you’re talking about Quicktime Player, it doesn’t support 360 video at all. What you get if it’s working right is a weird flat distorted view of your entire 360 video. I use VLC or GoPro VR Player to view 360 videos on my Macs. Which one I use depends on which Mac. VLC works better on my Mac Pro, GoPro VR works better on my MacBook Pro (where I usually render video because VIRB Edit will use the graphics card on the MacBook Pro but not on the older MacPro, so it’s a little faster). YouTube is a slightly different story. If you go there and search for instructions on how to post 360 video, you’ll find that you need to add a little metadata to them before you upload. They provide an app, the “Spatial Media Metadata Injector”, to do that. It works. I’ve put many 360 clips on YouTube, and they work just fine in Safari on the Mac. It’s more fun to watch them on an iPad, though, where the view changes as you physically move the iPad around. I tried VLC and although the video plays back it is not at 5.7k bz it looks like the optimized version that Garmin Virb Edit uses for editing purposes. 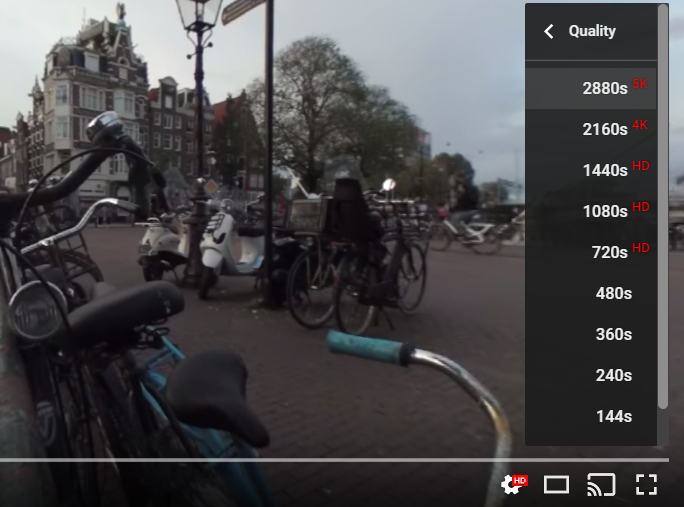 The video playback using GoPro VR player is also not sharp. UR right about the weird flat distorted view I get from Quicktime; however the QT playback is much sharper that either VLC or VR player. Hi, i’m trying to stitch 5.7K footage I shot over 2 years ago. I do not have the VIRB 360 camera anymore (it was a borrow) but I do have the two mp4 video files (I also have two .THM files, one for each of the video files). 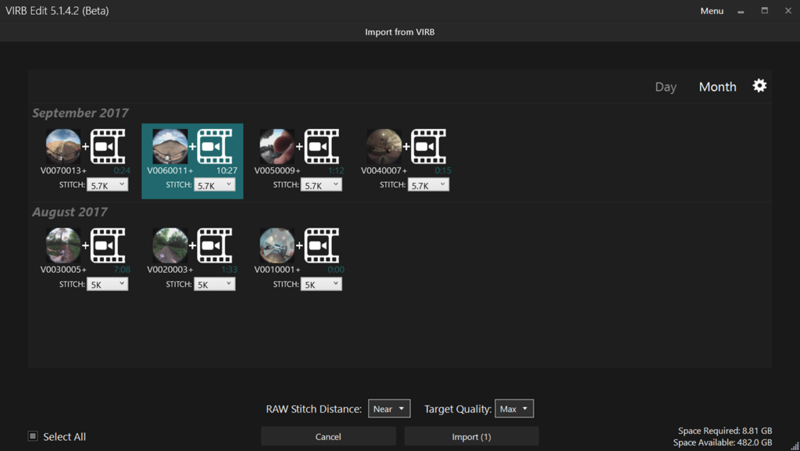 When I import these two files into VIRB Edit they are not automatically recognized as two halves of the same footage and thus I don’t see the option to stitch. Is the VIRB camera needed to be plugged into the computer for VIRB Edit to recognize the files as two halves? Do you know if there is a way around it so I can stitch my 5.7K files from disk? Thanks. I’m afraid you need the meta data from the SD card to stitch it. Ah, that’s too bad. Do you mean the specific SD card to which this footage was originally written to by the camera while recording? I don’t recall there being any other files on that card except for the mp4 and THM files but I can easily have missed some. I don’t know if I can still retrieve the original SD card. This goes only for stitching in VIRBEdit right? I could still start from scratch in Mistika or alike? Thanks again. Thanks Paul, i’ll have a look and report back here if I end up trying it. I have an iMac and Virb edit will not stitch 5.7k on a Mac. What software can I use to stitch 360 video on my Mac?